You are here: Home Cat Jewelry 14k Rose Gold Brown Diamond Cat Pendant (1/3 cttw), 18"
Crafted in 14 karat rose gold, this charming feline sparkles with 27 brown diamonds (1/3 cttw) set in black rhodium and rose gold. 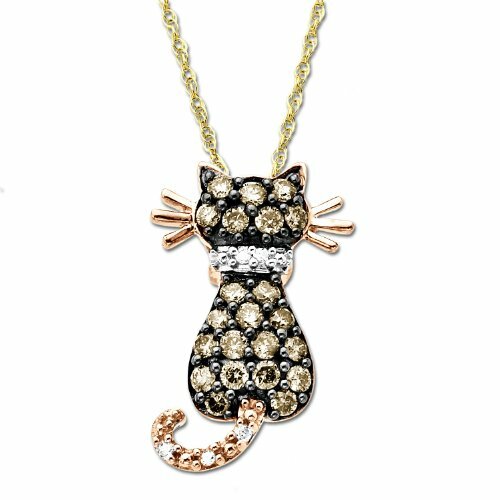 With polished gold whiskers and a sparkling tail and collar, this petite pendant makes a darling gift for a cat lover. It presents on an 18-inch light rope chain, also in 14 karat gold. Enjoy this pendant with the chain provided, or add a different gold chain of your choice.